A month ago, I told my husband that our dog lives the life of Riley. After I said it, I asked, “who is Riley, and what kind of life did he lead?” Then I started thinking about other words or phrases (idioms), so here is what I found out as to where they came from. Since there is always conflicting information out there, I’m going to find the one farthest in history (not Wikipedia). To answer my question, “who is Riley, and what kind of life did he lead?” is a boring one. When we say, “He lives a life of Riley,” we mean that “he” has an easy and pleasant life. According to history, no one can truly say who Riley is or even of the correct spelling, Reilly, O’Reilly. 1883 lyrics in a song, written by Pat Rooney, suggest sarcasm toward the NY city registrar, John Reilly, regarding how he profited from his position. “A hundred a day will be very small pay / when the White House and Capitol are mine.” Even though living the life of Reilly doesn’t appear in his lyrics, they sung of a Reilly and his easy, rich lifestyle. From the collected information, the assumption is the phrase was created or was a local known expression that spread during WWI. The French picked it up along with British soldiers, who were familiar with Rooney’s song. Haven’t we all eavesdropped at some point in our lives? Some more than others, but depending on the situation, people have a tendency to want to find out about something or someone without directly asking. Therefore, we will eavesdrop on a conversation to find the answer. I’ve become a documentary junkie. While watching a documentary of Henry VIII (Inside The Court of Henry VIII Documentary 2015), at (28:00) it explains how the term eavesdropping came about. It’s fascinating and interesting to learn about such words used in today’s time that are linked back hundreds of years ago. Henry VIII had acquired Hampton Court Palace. 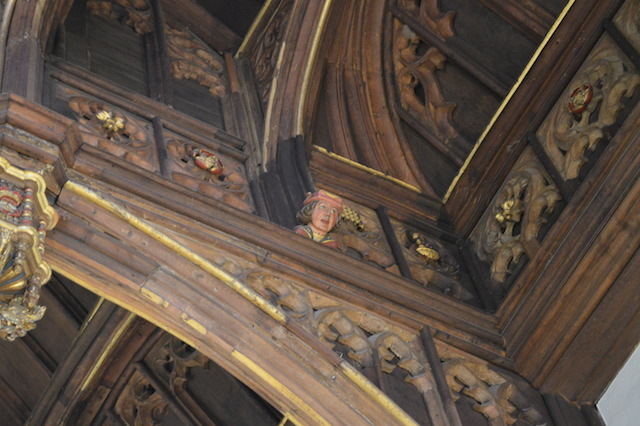 The Great Hall inside the palace had painted figures in the eaves throughout called eavesdroppers. Henry VIII had them placed there for a purpose—reminders to the courtiers that everything they said was overheard. Did you know Crocodiles can cry? I didn’t. Like most animals, crocodiles have tear glands. When they eat their prey, they huff as they blow air out of their nose, which may press and cause their tear glands to empty. The first recorded instance of crocodiles weeping shows up in a travel narrative from 1400. 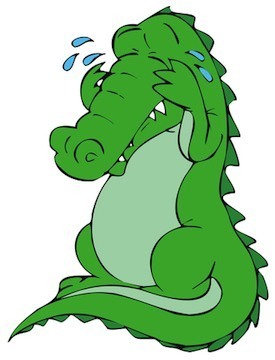 When someone says, “He’s crying crocodile tears,” they mean he isn’t sincere. The expression dates back to the mid-sixteenth century. Archbishop of Canterbury spoke of the life of Edmund Grindal as “I begin to fear, lest his humility . . . be a counterfeit humility, and his tears crocodile tears.” This stems from belief that crocodiles would weep to lure their prey. The prey would come close and the crocodile would eat it with tears coming down. Beware of those with crocodile tears. We all come across people who rub us the wrong way, or it might be the other way around, we rub them the wrong way. Actually, we don’t have to meet the person for them to rub us the wrong way. According to what I found, this phrase is from colonial times. In houses with oak-board floors, servants were to wet-rub and dry-rub the floors. They were to rub along with the grain of the wood. If done wrong, there would be streaks all through the wood floors, embarrassing the owner of the house, and him calling the servants clumsy. Usually, when someone rubs us the wrong way, it’s from a clumsy thing they said or action. What words or phrases have you wondered about their etymology? P.S. If you get a chance, stop on over at JeriW’s site to read about my experience in compiling an anthology. Very interesting. I’ve not thought about this before, but the ‘Life of Riley’ expression is well known to me too. It was quite often used by the older generations, but not so much by me or the youth of today. I think it is slowly dying out. As you say, I doubt we will ever know the origins with any degree of certainty. The most plausible explanation to me is that it refers to the work of James Whitcomb Riley, a poet whose work described a rather fine lifestyle (apparently – I’ve not read any myself). I see that Riley was also mixed up in US politics at one stage and he has appeared on a US postage stamp, so seems to have been high enough profile for this expression to emerge with the slightly contemptuous/envious overtones that it still has today. Ray, I think I’m showing my age when I picked these sayings. I didn’t read that one about James Whitcomb Riley. Thanks for sharing. I loved reading these! I knew about the eavesdroppers already because of a book I read based in a church, and also about the crocodile tears from a book by Anthony Horowitz called Crocodile Tears… I guess a book does make you smarter! But I didn’t know about the rub the wrong way one, and that was interesting to me! Olivia, you are wise beyond your years. It took me a long time to learn about these phrases. Glad you enjoyed the read. I had not heard the “life of Riley” saying before. I’m not surprised “eavesdropping” can be attributed to the doings of Henry the VIII. When I used to teach To Kill a Mockingbird, I would do some overview lessons on idioms and colloquialisms. One that always sticks in my memory is “madder than a hatter.” Lead used to be used in felt that lined hats. Not good. Jeri, you just made me feel old. I actually never heard of “madder than a hatter” but I love where it originated from. Thanks. I always wonder who Larry is as in – as happy as Larry. KB, I’ve never heard of that saying. Hmm.. I might have to find out who Larry is and what he’s up to. 😀 Thanks for stopping by. This was fascinating! All of our weird and wonderful idioms are one of my favourite things about the English language. One I’ve always wondered about – and have never come across a definitive explanation for – is ‘raining cats and dogs.’ When I taught English in Sweden I was asked about it all the time, and had to admit that I hadn’t a clue! Hi Claire, I find language fascinating, especially since I’m trying to learn a second language. I don’t know where “raining cats and dogs” come from. I’ll have to look that one up. Awesome research on these. I hadn’t heard of “Life of Riley” before. That one’s completely new to me. The rest I’ve heard but didn’t know the background. Like, I know most of them are phrases, but I would have just assumed that the word eavesdrop was it’s own word. Not something that Henry VIII came up with to spy on people. Gotta love the English language. ABFTS, Okay, now I’m really feeling old. Until I watched that documentary on Henry VIII, I assumed eavesdropping was a word derived from another language. I didn’t know it actually has a history. This cracked me up! My grandparents use to say “You live the life of Riley” to me all the time. It wasn’t until I was writing and used the phrase myself that I realized I had NO idea what it meant or where it came from. It made me wonder if readers would have the same reaction so I also tried to get a handle on it too but didn’t get nearly as far with it as you have. I think we may be broadcasting on the same frequency!